Calculating oil or gas in place from petrophysical analysis results is a simple matter of calculating volumes from reservoir thickness, porosity, and water saturation. The area of the reservoir is usually contoured from maps of the reservoir properties. For single well analysis, a spacing unit is usually defined as 160 acres for oil wells and 640 acres (1 square mile) for gas wells. These dimensions are approximately 640,000 and 2,550,000 square meters in Metric units. Reserves are defined as the amount of oil or gas that can be produced from a reservoir with current technology at current prices and current costs. Since these change on a daily basis, economic reserves can vary with time, increasing or decreasing with changes in the overall world economic conditions. Decline curve analysis and material balance methods are used to calculate remaining reserves based on actual production and pressure data. Coupled with the volumetric analysis from petrophysical data, a reasonable solution can usually be found, although differences between the results from the three models may lead to a revised reservoir description. Additional data might be needed to resolve discrepancies, such as additional production history, new wells, better PVT data, or a new geological interpretation. In some parts of the world, oil is measured in metric tonnes instead of barrels or cubic meters. 9: RF = (Sxo - Sw) / (1 - Sw) or from decline curve analysis or analogy. Recovery factor is difficult to estimate and is often known only after the pool, or an analogous pool, is depleted. Recovery factor can have a broad range for oil (0.01 to 0.95) and a narrower range for gas (0.50 to 0.95). Remember to round your answers to two or three significant digits, which you started with. Tar or bitumen, and sometimes heavy oil, is measured by weight of tar in place as opposed to volume of oil in place. Some Former Soviet Union countries record conventional oil reserves in tonnes. 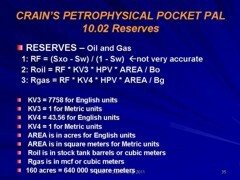 The following formulas are for use in areas where reserves are measured in metric tonnes, or as weight fraction (or weight percent). All densities are in kg/m3 in these formulae. Results are in tonnes/m2 except where noted. To obtain tonnes in place, multiply by area in square meters. To obtain reserves, multiply this result by a recovery factor. CAUTION: Some core analysis results do not include water (dry basis analysis). To compare log analysis results to core, eliminate the water term from WTrock. NOTE: In much of Eastern Europe and Asia, oil quantities are reported in tonnes and not barrels. The "tar" equations provide the conversions needed. When using this method for oil, replace the word “tar” with “oil” to prevent confusion. The volume of hydrocarbon in a gas hydrate js a function of the hydrocarbon type and the porosity only. Water saturation is meaningless. The ratio of gas to water would range from 433 scf/bbl for propane to 1230 scf/bbl for methane. This is equivalent to 170 cubic feet (for methane) per cubic foot of pore space (or 170 m3 per cubic meter of pore space) at standard temperature and pressure, for methane, and 60 cubic feet of propane per cubic foot of pore space, regardless of depth of burial.